What’s Your Favourite Camp Food? 1. Brownies. The kind that come in the big tray, all flat and gooey, not the ones in individual casings with weird strawberry stuff in the middle. The gooier the better. Add some milk into the mix and you’ve got the perfect desert. 2. Pizza. Sometimes its super cheesy, sometimes there’s a bit of meat thrown on top. But however it’s made, it’s delicious, and I’ll keep eating it as long as you keep making it. 3. Pasta Night. Ok so you can pretty much have pasta everyday, but once every 2 weeks we have ‘pasta night’, a glorious dinner that involves different types of pasta, a choice of sauces and various toppings. More please. 4. Pulled Pork. This one is a bit like marmite – you either love it or you hate it. Ok fine, I think I’m in the minority when I say I love it. But really I do. Pulled pork, a heap of BBQ sauce and bun. What’s not to love? 5. Marshmallow Mateys. Basically just a copy of (once banned in England) cereal ‘Lucky Charms’, these have become my staple breakfast food at camp. Forget the waffles and the bacon, just give me 2 packets of ‘Mateys’ and I’ll be all set until lunch. 6. Bagels. Whether you have them for breakfast with a schmear of cream cheese, or for lunch when they have been turned into the ‘pizza bagel’, these perfect buns with a hole in are always a treat. 7. Ice Cream. There’s nothing quite like ice cream at camp. What’s your flavour of choice? Chocolate, Vanilla, or Strawberry? Or a mixture of all 3? Whipped cream on top? Chocolate sauce? Sprinkles? Mmmm, delicious. And there you have it, my top foods at summer camp. Now, can the next 4 months hurry up so I can eat them all please?! What are some of your favourite camp foods? Ohhh great question! There are so many to choose from! I think my top two ‘campfire’ camp foods are banana boats https://www.pinterest.com/pin/388083692865665248/ and bannock https://www.pinterest.com/pin/388083692865665273/ which is essentially just bread on a stick over a campfire, but it’s so delicious! And I like to add a little cinnamon an sugar to mine. Ah we have a turkey banquet too…I’m the same, love te mash and stuffing! Favorite camp foods. Oh, boy do I have a bunch of stories about that (and also BAD camp food), several of which made it into (usually in the form of comic relief) my Abby’s Camp Days series. The good: Double chocolate banquet cake. YUM. My absolute fav. My husband was the cook when this recipe tradition started at camp, and we still make it (on very rare occasions) at home. It’s super yummy, although the frosting is what makes it. 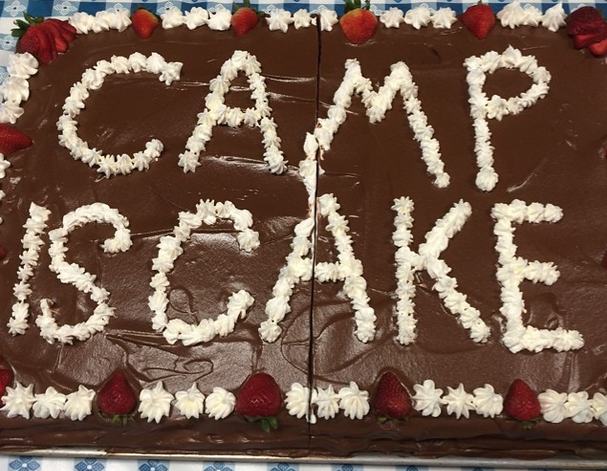 Over the years, several other camp cooks have tried to make it, but they always do something to screw it up (even when he gives them the recipe) by adding their own ideas/touches/alternative ingredients. None of them worked. Until this summer!!! We had this culinary student named Michelle for our assistant cook, and she made it perfectly. It was wonderful! Also, UDC. Most camps call it tater tot casserole. It’s the only food I make better than my husband (I use 2 cans of cream of mushroom soup, but he uses one can and then half a cup milk…mine is creamier!). 1. My dad (a camp dean and counselor) always tells the story of gross bread pudding that they kept not eating and kept being served. Finally, they hid it in milk cartons to throw it out without the cook knowing. He’s told that story, seriously, about a thousand times, so it made it into the very first Abby book. 2. The year we got a new dining hall, my husband had cooked with the new ovens for up to 80 people only. At one camp, we had about 130 people there, so he put extra pans of chicken in the oven (it was a huge confection oven). Unfortunately, the extra pans blocked the way of the heat, and it was underdone, and we had to give all the plates back for him to cook longer. An exaggerated version of that story ended up in Volume 5. My poor hubby (who wasn’t my hubby at the time, just one of my awesome camp staff buddies) didn’t even go to skit night that week because he knew all the jokes in the skits would be about raw chicken. Having to be an engineer to work the cereal dispensers. Kids who complain about the tiny speck of black on their otherwise golden-to-perfection marshmallows. There are many more, I’m sure. But I’ve already hijacked your post enough! I guess when you are a camp counselor who marries a camp cook, you have a lot to say about camp food, although only the chicken story was about when he was the cook. 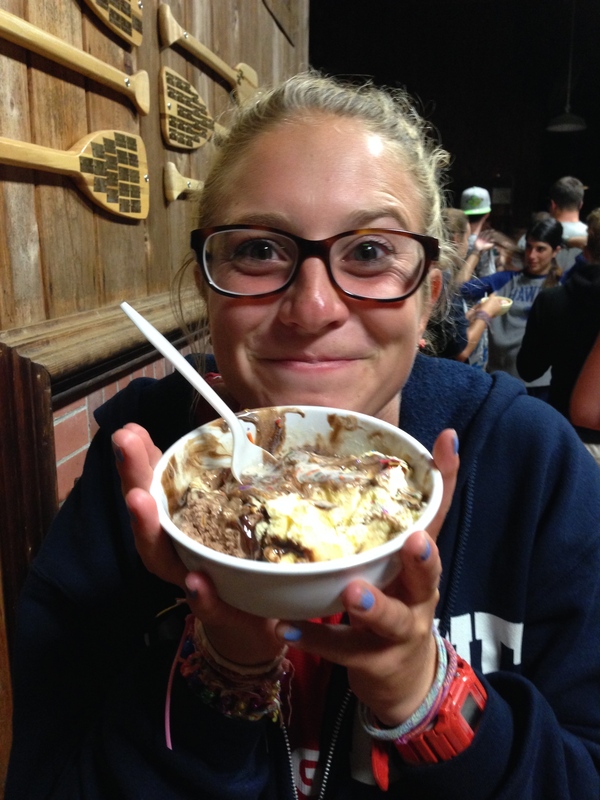 Haha so many great camp food stories…I love it!